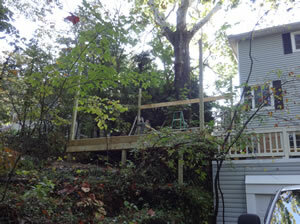 This client wanted to find a way to make use of a totally unusable space on a hill next to an existing deck. They called Creative Earthscapes to their house to look at the space and brainstorm ideas. After CE asked the client about their needs and concerns, we discovered they love the outdoors, but living in a rural area, they did not have a place they could enjoy outdoors without avoiding mosquito and other bugs. 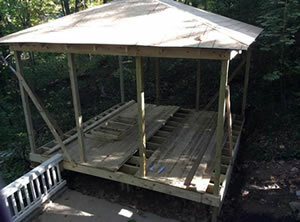 After some measuring to maximize the space, a 15' x 15' screened gazebo emerged out of the hillside using premium southern yellow pine. Walls were formed and vinyl siding installed to match the house. 360 degrees of screened windows were installed to maximize the clients beautiful view. A hipped roof with matching shingles top off the addition. Inside is complete with bead board and a designer ceiling fan. Our clients, in the middle of the famous Walhalla in Clintonville Ohio love the screen room. They use it all the time in the Spring, Summer, and Fall. These clients have contracted CE 2 more times since the completion of this project. 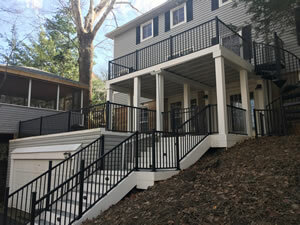 We have installed a beautiful aluminum fence, functional Unilock Artline Paver patio with a series 3000 sailor course, and a walkway that leads to a set of stone steps and versa lock retaining wall.